The Bruce T. Wallace Award, established in 1990 in memory of the Association’s first executive vice president, who served for over 29 years, is awarded by the Executive Committee to an individual who has distinguished himself or herself through years of exceptional service to NASBP and to the surety industry. The recipient is an individual who has conducted themselves throughout his or her career in accordance with the highest ethical standards and demonstrated a service characterized by commitment, consistency, intensity, and impact. It is noteworthy that the Bruce T. Wallace Award is not necessarily presented every year, but only when a candidate meeting these high standards is nominated. In fact, since its establishment, the Bruce T. Wallace Award has now been presented 20 times. Recipients receive a framed certificate personally inscribed in three-toned color calligraphy and signed by the NASBP President. The recipients' name is emblazoned on a plaque and added to the tomb of recipients of the award which is displayed at NASBP headquarters. 1990 - Vincent J. Como, Como and Nicholson, Inc.
1992 - John J. Curtin, Jr., Curtin International Insurance and Bonding Agency, Inc.
1997 - Richard S. Beck, Willis of Pennsylvania, Inc.
1999 - William E. French, The Bottrell Insurance Agency, Inc.
2000 - John P. Martinsen, Cobb Strecker Dunphy & Zimmermann Inc.
2002 - Dennis D. Flatness, Welsch, Flatness & Lutz, Inc.
2010 - A.C. “Ace” Tinch, Harding-Conley-Drawert-Tinch Insurance Agency, Inc.
2013 - Matthew K. Cashion, Jr., The Cashion Company, Inc.
2016 - John N. Bustard, King & Neel, Inc.
2017 - Edward J. Heine, Paynewest Insurance, Inc. 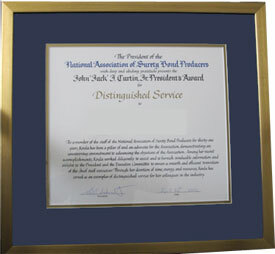 The award, named the “John ‘Jack’ J. Curtin, Jr. President’s Award,” honors an individual, who is chosen by the NASBP President for their outstanding service contributions during the President’s term to the Association and to the surety industry. The award was first presented in 2007 to John ‘Jack’ J. Curtin, Jr., for whom the award is named. Curtin, a past NASBP President, passed away in 2008, and had been a faculty member of NASBP’s acclaimed William J. Angell Surety School for 30 years. Curtin had served as a member volunteer in NASBP at all levels, including Director, Regional Vice President, as well as, Chair of several NASBP committees. 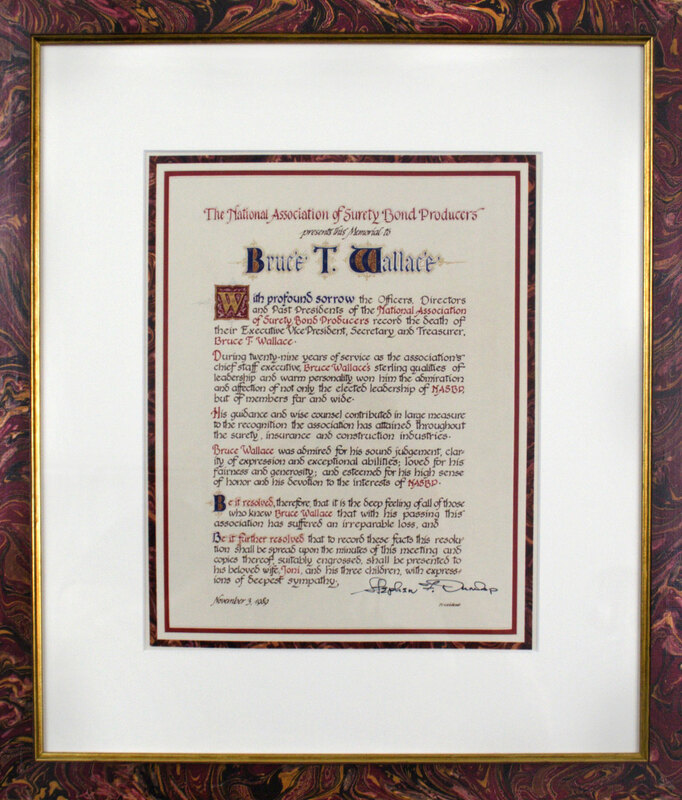 Recipients of the President's award receive a framed certificate personally inscribed in two-toned color calligraphy highlighted in gold and signed by the NASBP President, as well as, a specifically minted NASBP President’s medallion customized with the NASBP logo and made of 2-troy oz. .999 fine silver. More information about past winners, can be found in past Pipeline issues. 2010 President's Award winner and the 2010 Bruce T. Wallace Award winner. 2013 President's Award winners and the 2013 Bruce T. Wallace Award winners. 2015 President's Award winners and the 2015 Bruce T. Wallace Award winner. 2016 President's Award winners and the 2016 Bruce T. Wallace Award winner. 2017 President's Award winner and the 2017 Bruce T. Wallace Award winner. 2018 President's Award winner and the 2018 Bruce T. Wallace Award winner. 2007 - John ‘Jack’ J. Curtin, Jr.
2009 - Matthew K. Cashion, Jr.
More information about past winners, can be found in past Pipeline and Surety Bond Quarterly issues.